SYNOPSIS: From Walt Disney Pictures and visionary director Tim Burton comes an epic 3D fantasy adventure, ALICE IN WONDERLAND, a magical and imaginative twist on some of the most beloved stories of all time. JOHNNY DEPP stars as the Mad Hatter and MIA WASIKOWSKA as 19-year-old Alice, who returns to the whimsical world she first encountered as a young girl, reuniting with her childhood friends: the White Rabbit, Tweedledee and Tweedledum, the Dormouse, the Caterpillar, the Cheshire Cat and, of course, the Mad Hatter. Alice embarks on a fantastical journey to find her true destiny and end the Red Queen’s reign of terror. The all-star cast also includes ANNE HATHAWAY, HELENA BONHAM CARTER and CRISPIN GLOVER. The screenplay is by Linda Woolverton. The Mad Hatter: "There is a place. Like no place on Earth. A land full of wonder, mystery, and danger! Some say to survive it: You need to be as mad as a hatter." So what is Alice doing there? Is she mad, curious, or just there by accident? Or is she the needed champion to save Wonderland? Wow! What story can possibly ooze more fantasy goodness than Alice in Wonderland? What better story to produce for the big screen using today’s technology and movie making advancements? What movie can lend itself most appropriately for 3D viewing? What concept could be better for someone like Tim Burton to direct and add his touch and “dark” effect? This movie is all that and more. It is captivating, amazing, and magical. Part of that is probably the Disney effect. Actually, there is a scene that is reminiscent of the Haunted Mansion ride in Disney World . . . a small round room with no exit. Visually the movie is entrancing. Not quite as good as Avatar but not too far behind. The special effects are spectacular, as they would need to be in order for this production to be successful. Two of the better features of this film were the makeup and costumes which are made most obvious by the Mad Hatter (Johnny Depp) and the Red Queen (Helena Bonham Carter). Both features were very appropriate and well done. The Red Queen: "Off with their heads!" Yeah, we get a lot of that throughout the movie and I loved when she said it every time. One of the three biggest treats in this movie is Helena Bonham Carter as the Red Queen. Oh boy, she was beyond excellent for this role. I believe Burton and Carter were made for each other because they fit perfectly together; she fits best in his movies and his movies need an actress like her to bring a character to life the way he would want it. This was one of her best roles and performances. Next treat is of course, none other than Mr. Depp. He also fits perfectly in Burton’s movies and this is no exception. The Mad Hatter indeed, in this context, no one could have done it better. 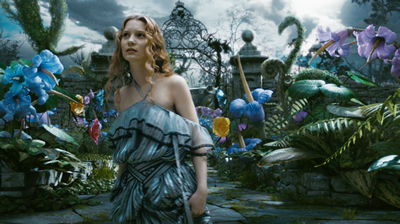 And then there’s Alice played by Mia Wasikowska. Even though there is a hint of humbleness in her performance, she steals your attention whenever she is on the screen. Not knowing her well enough to know what to expect, her performance was sharp and she was also superbly cast for this picture. Oops, I lied, there is a fourth treat to this movie and that is Disney teaming up with Tim Burton to do this “wonderful” project. It’s kind of like putting diced filet mignon on a pizza . . . they are individually incredible but you would think that together it just wouldn’t match. Well, it actually tastes pretty good (not that I have tried filet mignon pizza but now that I mentioned it, it’s not a bad idea!). Now don’t worry because Tim does not go to complete darkness as he is capable of, i.e. Sweeney Todd, so the movie is legitimately PG and kid safe. He still does a killer job with it though. Crispin Glover as Stayne was also well cast but his performance was nothing to write home about. Matt Lucas as Tweedledee and Tweedledum was adorable and good comic relief. It seemed a little odd seeing Anne Hathaway play the White Queen, not that her performance was bad, just odd. What they did with the story was an interesting twist. You still get a lot of the classic story in that Alice follows her own footsteps in almost the exact same way but the twists give it more action, beef up the plot, and it turns this into a decent sequel. This is one fantasy adventure you might regret missing in the theater.